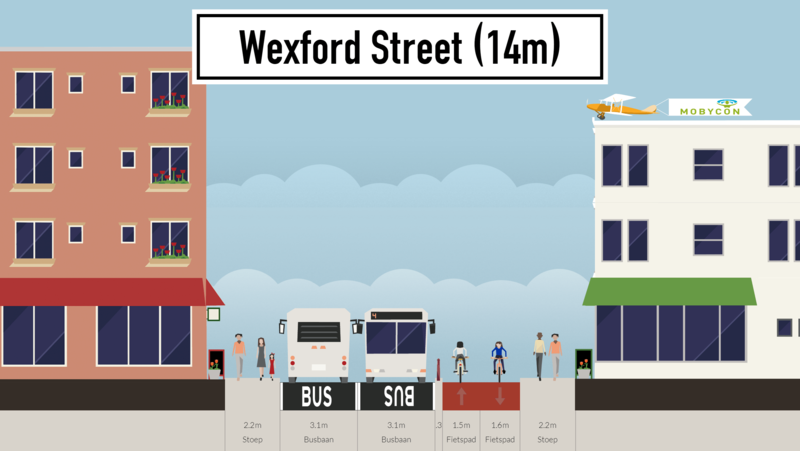 What to do with a problem like cycling from Dame St to Camden St? 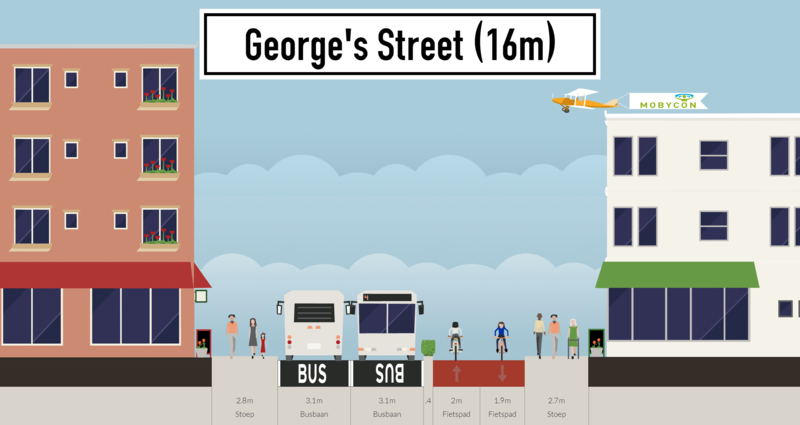 COMMENT & ANALYSIS: Following on from the popular article last year on What to do with a problem like cycling in Rathmines?, we look at what is possable between South Great George’s Street at its junction with Dame Street to Camden Street. Years ago a senior council official told me that this route needs to be upgraded urgently. Yet, is still is a desperate state for cycling — narrow cycle lanes, regular loading (both illegal and some legal or semi-legal) blocking cycle lanes, and bus lanes. The project to look at options to upgrade the cycle route was suspended, along with other projects, while Luas Cross City was under construction. The National Transport Authority are planning on upgrading bus priority along this route — they have released no firm plans yet but the only way to have strong bus priority and provide cycling segregation along this route is make it most of the route bus and access only. Access to/from the car parks etc around the west side of Grafton Street and deliverers on the north-south route can be maintained via the cross streets (east-west), and via Cuffe Street. The typical width along this route varies, but it is mostly over 16-17+ metres. The map of the route below shows the width by colour — 16 metres is in pink and 17 metres is yellow. There’s also areas of 18-19 metres (blue and light below) and significant sections of 20-23+ metres (green). There’s a few pinch points smaller if smaller widths (13-15 metres) but these are limited in number and short in nature. IrishCycle.com’s suggestion for the route is a two-way cycle path. While two-way cycle paths are not liked by some transport officials and some campaigners, the option of using a two-way path on one side of the route has gained a large amount of success in London and elsewhere. Mark Treasure, chairman of the Cycling Embassy of Great Britain — a group with seeks Dutch-like cycling provisions in the UK — has a great thread on Twitter on the pros and cons of two-way cycle paths. It’s worth reading if you’re borderline on two-way cycle paths in this kind of context. In any case, a lot of what is said about two-way routes just does not stand up — for example, I’ve heard it claimed recently that the Dutch are not still building them in urban settings — yet, Utrecht, Amsterdam and other cities are building them to this day. This route in question is suited to have a two-way cycle path because of the way the traffic light-controlled junctions are set up at the main cross-streets, and, if most of the traffic lanes were made bus-only, the buses would be going straight along the cycle path for most of the route, thus removing turning conflicts and allowing buses and people cycling on the cycle route to flow north-south at the same time. If the route is continued the full way to the canal (and that’s not necessarily the only way to continue), the very narrowest section is 13 metres and that’s a squeeze but it is very short (only around 10-15 metres before it starts widening again) at Richmond St South in Portobello. What’s suggested in this article would not be an easy sell to many people, but it would allow for a much-needed upgrade of public space, while also providing a strong north-south bus route and provide for cycling for all, linking between the canal and close to College Green. It would enable more liveable streets, better public spaces, and provide extra people-moving capacity by bicycle and bus, and maintain delivers and access. IMAGES: Made with thanks to streetsketch.mobycon.nl. This looks fantastic, and I feel I would be living in a dreamworld if it came to pass. To play devils advocate, where would existing private traffic go? Some will dissolve due to better connectivity for bikes/public transport, but the balance has little alternatives. To the east is the luas line and to the west is residential streets of portobello. Orbital routes would need to be created/promoted. The only situations where I can see the point of two way cycle lanes are where one side has a lot of junctions and the other doesn’t. The Howth cycle lane being a good example, which could be made better by closing some car parks. I don’t see what advantage a two way cycle lane has over two one way lanes has on this route. I cycle along there regularly and the only part that is problematic is where Wexford Street meets Lower Camden Street. This is due to people leaving their cars at the side of the road and could be fixed by making it a clearway and of course, actually enforcing it. Having to change to the ‘wrong’ side of the road only to change back later would be a big downgrade as far as I’m concerned. It’s good to see that you are acknowledging that this love of two way cycle lanes is not universal now at least. My preference in most cases would be for 2 way cycle lanes. – They require less space – a one way cycle lane needs to be wide enough for someone to cycle, and someone to overtake at a minimum. On a two way cycle lane each lane can be slightly narrower as you can use the incoming lane for overtaking. – When building segregated cycle lanes, minor side roads should be closed, or through access removed. With a two way you only need to do this on one side of the road. – I don’t agree with the argument about having to change lanes only to change back again. Surely that depends where you are going to/from? If we have a network of two way cycle lanes connecting into eachother, and well designed junctions allowing you to cross safely, it shouldn’t be an issue. @mossyb — good question and I should have had more about it in the article. I’ve been thinking about this for some time and the reason I’m suggesting it now is because the conditions will be right to do it after College Green Plaza is in place and when further bus priority measures are being put into place under BusConnects (which the lite-BRT routes are now merged into), if approved — Dame St will be a dead end for private motorists, Parliament Street will be bus-only at least in in one direction, George’s St will need bus priority sooner or later, there’s far less private capacity on the quays (and there will be even less if/when the Liffey Cycle Route goes ahead), and some of the limited on-street parking is being removed for a number of reasons including stationless bicycles share. The question I’m left with is: where are these cars going? Bride Street / Golden Lane / Cuffe Street etc can provide access to the private car parks. People driving from say Rathmines who currently drive via the Rathmines Road and Camden St would instead go via Harold’s Cross or Ranelagh. There will likely be fear that such measures will just shift traffic onto more residential streets but the evidence from Paris in recent years and the Netherlands previously is that you get modal shift and car reduction. That doesn’t mean cars will all disappear — some routes that are clogged with cars will remain clogged. @Eric — I think your view on the benefits of two-way is related to the how problematic you see this route as it currently is. I see it as highly problematic from start to finish, and most people I’ve ever spoken to hold the same view of it — and that feeds into my view. This is a summary of what I think is wrong: Narrow cycle lanes starting at the Dame St end mixed with blockages by legal and illegal loading often at any time of the day along the route, no segregation at bus stops, no segregation at junctions, taxis swinging in and out of the cycle lanes to pick up passengers, being squeezed between legally parked cars and slowly moving ones on Wexford Street, a free-for-all on loading on Camden Street, and speeding an issue at different parts of the route but especially near the Camden St end where the street is wider. As for having to change to the ‘wrong’ side — my experience from using and looking at such paths is that any potential need to cross twice is outweighed by the safety, comfort and time saving of having a continuously segregated route. Note: This isn’t like the Grand Canal Route — this cycle path would flow north-south at the same time as the bus route beside it and unlike the canal, most of the side streets are one-way, again allowing for greater flow on the route. The idea of crossing twice is far less likely than you might think — the cycle path would be on the east side of at least most of the route and most of the trip attractors are on that side. So, most people would not be crossing twice. Similar fears were had about the two-way cycle paths in London and now they are a success story, with growing numbers of people cycling on what is still a fairly limited segregated network there. I don’t think I was ever in denial about some people’s misgivings about two-way paths and I’ve tried to address the points people make as much as possible. Where do all the cars go? The cars go nowhere! When people will see there is no getting through the city centre without being greatly inconvenienced, they will stop using the car and move to other modes of transports. I have seen this happening in some many cities in Belgium and The Netherlands. I remember many cities where cars were bumper to bumper on all main roads. Now many of these roads are pedestrianised or their through access has been removed. People haved move to walking, cycling (including electric), scooters and public transport. It worked, and still works there so I cannot see why it would not work here.